Many people know there is a connection between the black color and sun rays, and think that black shirts have a better UV protective level than other colors. But the truth is that the color itself is not a factor to block away UV radiation. Black color does attract the light and absorbs it better than white color. But absorbing the light energy does not mean filtering the UV away. In the one minute clip below you will see how black absorbs more light energy and has higher temperature. The sun sends “white light” (which is all the colors combined) when this light hits any object, the light can either reflect or be absorbed. White and fair colors reflect the light. when you see a “white shirt” it means most of the white light was reflected. If you see a blue shirt, it means all the other colors in the “white light” were absorbed except the blue which reflects away, and that’s how our eyes sees the shirts as a “blue shirt”. When you see a black shirt, it means most of the light was absorbed and very little was reflected. Dark colors absorb more light, so they can absorb more of the UV light which comes with it. But color is only one of the factors a fabric has. Fabric content, color dye, weight and weave all have affect on UV protection. A loose weave fabric will have less UV protection compared to a dense weave fabric. The loose weaving has more “holes” in the fabric, UV light will pass through those gaps. So even if it was black you can’t relay on it for UV protection. UVB are short sun rays which can be blocked by wearing any fabric. Wearing a white shirt will block UVB rays as much as a red, blue or black shirt. UVB are skin burns UV rays. UVA are the longer sun UV radiation waves and they can penetrate many fabrics, no mater of their color. Wearing a black shirt which does not have a UPF rating will not protect the skin from UVA harmful radiation. Though the shirt fabric might get warmer (as dark matter absorbs more light energy than light tones), the UV penetration to the skin will be harmful. UV protective level of clothes and fabrics is done in a laboratory, where UV rays are beamed at the fabrics from one side, and UV sensors on the other side record the amount that penetrated through. In such lab test, a white UPF shirt will block more UV rays than any non UPF black shirt. 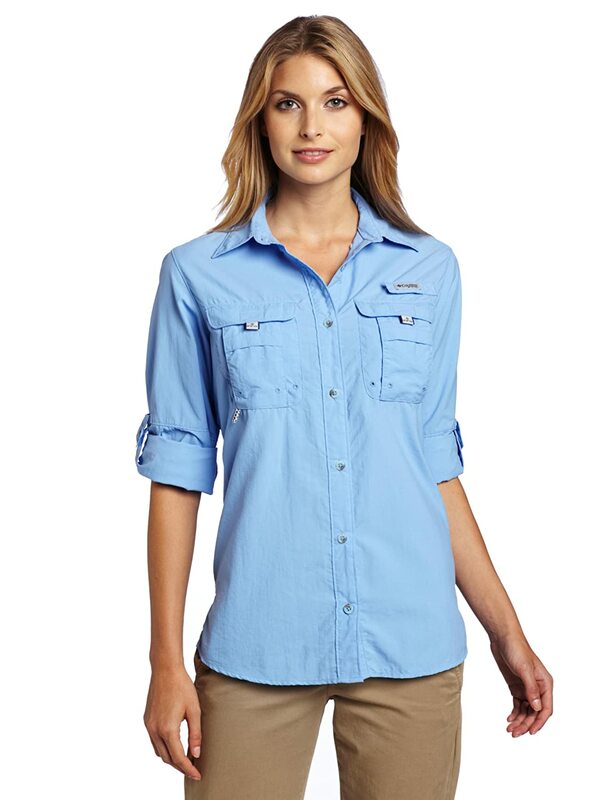 Looking for UPF clothes? Do not fall for cheap “black color UV protective claims”. When it comes to your skin health or your children’s skin safety, it is recommended to invest in top UPF cloth brands like Coolibar or Colombia. Less known brands have been found to fail UV tests, though claiming UPF ratings for their items. 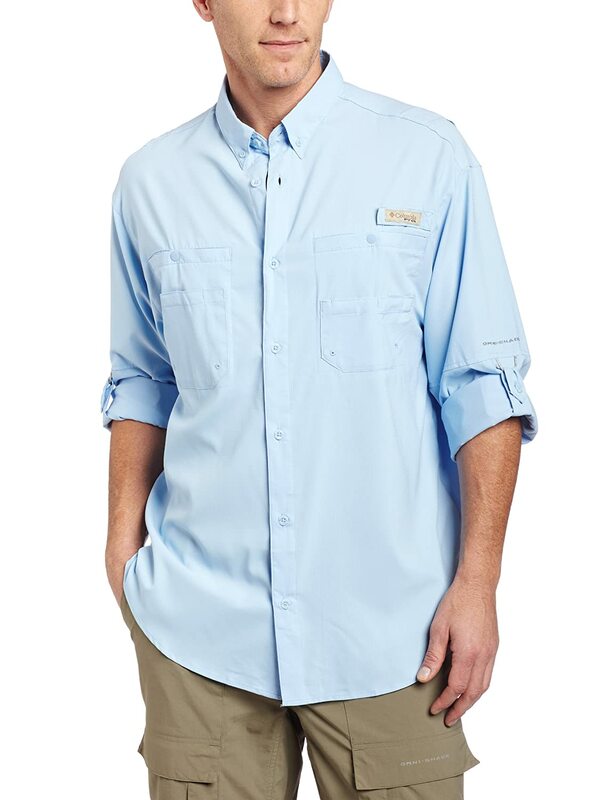 For example the shirt on the right is a Columbia’s Omni-Shade shirt which is far more versatile, combining a tight-weave construction, UV reflectors, and UV absorbing technology for a high UV protection level. It wil protect you much better than any black T shirt you may have in your wardrobe. Find more colors and more shirts like this one here. The protection level of fabrics depends more on the type of material the fabric is made of (Nylon, Polyester, Cotton) the density of the weave, and any specific chemical coatings and dyes used for it’s UV protective features. Men’s UV protective clothes like the Columbia’s Omni-Shade you see on the left, are using advance technology to block way most of the harmful UVA and UVB. Once you found your desired UPF clothes, you can pick any color you like, and know they all give your skin the maximum protection level. This entry was posted in UPF Clothing, UV Skin Damage and tagged Black Color Shirts Protect From UV Rays, Black Shirt and UV Rays by UPF Clothing Admin. Bookmark the permalink. ← Previous Previous post: Watch Out From Cheap UPF Clothing..